A new, up-to-date edition of the popular and comprehensive encyclopedia to pastels by professional artist Judy Martin. Many manuals on pastel painting take for granted the use of traditional soft pastels, a dry medium that provides the richness and variety of paint colours. Soft pastel is certainly the most versatile and widely used, but the modern range of materials include other pastel types that have their own specific purpose. In this exhaustive A-Z reference for artists of all skills, a variety of different pastel types are detailed, from oil through to water-soluble pastels, amongst the multitude of techniques broken down and easily explained. The book itself is divided into two sections: the first provides step-by-step demonstrations that guide artists through a variety of techniques, from basic colour mixing through to creating special effects such as sgraffito and sfumato. The second part focuses on themes, illustrating how individual artists tackle a number of subjects, including natural landscapes, urban scenes, figures, animals and still life. This resource provides a wealth of stimulating ideas to help artists both amateurs and veterans develop their own pastel style. 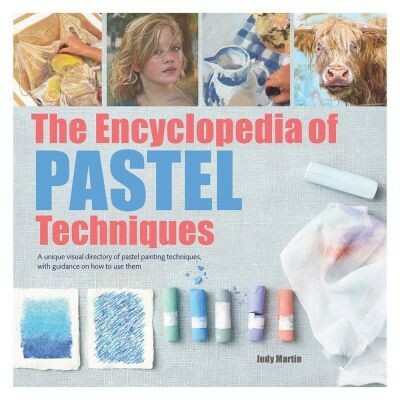 Judy Martin is a painter and teacher also known as the author of a number of practical art books. She lives and works in Brighton, on Englands south coast, and exhibits in her home studio every year for the Artists Open Houses during Brighton Festival. She studied painting and printmaking at Maidstone College of Art and went on to a two-year postgraduate degree at Reading University. She was a freelance writer and editor for a period of fifteen years, and has subsequently worked in adult education and at a mental health day centre, facilitating groups in art craft and ceramic work.